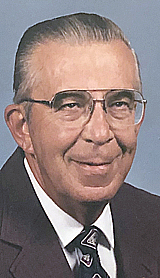 BLAINE — Darrell E. Dotzenrod, 89, died Monday, March 25, 2019 at Edgewood Senior Living in Blaine, Minnesota. A long-time resident of Austin, Darrell spent the last three years living in Blaine. Darrell was born October 6, 1929 in Preston, Minnesota to Virgil and Jeannette (Maxson) Dotzenrod. He graduated from Austin High School in 1947 and attended Austin Junior College. He was married to Carol Fullen on December 23, 1950 in Austin. Darrell served in the Army National Guard before beginning his career as a livestock buyer with Hormel in 1947. Later, he worked as a plant foreman until his retirement in 1990. He resided in Calmar, Iowa, Chatfield and New Ulm, Minnesota before returning to Austin. Darrell was a dedicated school board member and served as board president in Chatfield and New Ulm for more than twenty years. He was an active member of First United Methodist Church in Austin, serving on many boards and committees. He was a member of the American Paint Horse Association and supported his wife and daughters in raising and showing horses. He enjoyed spending time with his family and watching his favorite Minnesota sports teams. Darrell was preceded in death by his parents, his wife of 61 years, Carol Dotzenrod, daughter, Lisa Dotzenrod Fisher, sister, Virginia Milton, and brother, Charles Dotzenrod. Darrell is survived by his daughter and son-in-law, Teri and James Danhoff, Blaine, Minnesota; son-in-law, Robert Fisher, Los Gatos, California; grandchildren, Alyson and Matthew Logan, Blaine, Minnesota and Adam and Matthew Fisher, Los Gatos, California; great grandchildren, Raegan and Weston Logan, Blaine, Minnesota; sister, Eileen Lysne, Austin, Minnesota; sisters-in-law, Marilyn Dotzenrod, Plymouth, Massachusetts and Marjorie Cox, Marietta, Georgia; nieces and nephews. A memorial service will be held at 11:00 a.m., Saturday, April 13th at First United Methodist Church in Austin with the Reverend Dennis Tamke officiating. Interment will be at Oakwood Cemetery. Visitation will be held at the church from 10:00 A.M. until the time of the service on Saturday. The family prefers memorials to the First United Methodist Church or to the Animal Humane Society of Minnesota.